Parking is a no-hassle amenity since you can park your car downtown and simply ride the aerial tram. Make sure you bring your camera to capture the breathtaking views on the way up and the way down! The tram ride is free with your area lift ticket. It doesn&apos;t get much easier than that. 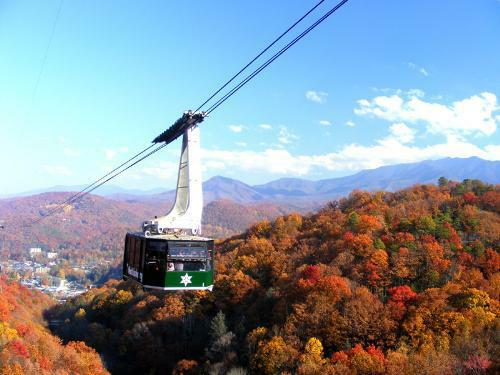 Ober Gatlinburg has eight trails and is serviced by two quad and one double chairlift. That keeps visitors skiing on the slopes instead of standing in lengthy lines waiting! Ober Gatlinburg begins making snow for the slopes as soon as the temperature drops and are carefully monitored and groomed with state of the art snow-grooming equipment. This helps keep the surface smooth and consistent and lets you enjoy your run that much more! Ober Gatlinburg ski resort also boats the only ice skating in Gatlinburg. Don&apos;t worry if you forget your skates, you can rent them there, along with any ski equipment you may need. The 140&apos;x75&apos; indoor skating rink in this Gatlinburg Tennessee attraction is open year-round. The rink is surrounded by shops and snack areas for those who simply prefer to watch instead of skate. Not only does Ober Gatlinburg feature ice skating and exclusive Gatlinburg skiing, there are also two 1,800&apos; tracks winding down the mountain known as the Alpine Slide. Your trip down the mountain in a brake equipped sled also includes a scenic trip up the mountain in a chairlift. Plenty of incredible photo-taking opportunities!